Very durable eco-friendly tote bag. Bought these in an affordable bulk order for my business for promotional reasoning. Had a great experience. Absolutely love these eco-friendly folding totes. I was able to customize them just the way I had hoped. My companies logo really stands out on these bags. Unique foldable bag that is very convenient and you can store easily. Thanks for the bulk order CEP. This bag was perfect after I customized it for my sports convention giveaway items. Highly recommend using this eco-friendly company. Big shoutout to CEP for the amazing custom-made folding totes for my business. These bags helped promote my business nicely. I ordered the red bag so that it would stand out against the rest of the free giveaways at the industry showcase. It worked in my opinion red is the brightest color. I did a white print on the red bag. Ordered these bags in bulk and was overly happy with their outcome! They fold and are perfect for any event! I was a big fan of the handle design of this bag. Good alternative to the plastic one time use bag. Clients love the fact that we care about the environment. It is very durable. You really cant go wrong with this bag, it has served us well. This is the folded bag we buy, we also use the PP4 and the RB12. All good bags that I would recommend. Awesome website, extremely easy to get a quote, I attached my graphic and boom I was done. I paid online and got a delivery date. Stitching is done well does not appear to have loose ends and the logo looks good in the place we specified thats all I care about. The last promo bag manufacturer I used online messed up big time on both sewing corners with loose ends and the prints were crooked. This is a quality bag at a reasonable price. I order it all the time for our events. Simple bag, your print comes out great, and the price is on point at bulk quantities. This was the giveaway at the walkathon. It helped us raise lots of money for a good cause. Perfect event bag, cheap enough to give it away as an advertising cost. The bags look great logo is printed well, and the folded option works. It doesnt crinkle. I customized this bag to the max. I did a different size and multi colors. For a marketing need, this bag is good to use, it stores away easy when you order large quantities, it is very easy to hand out at events and it is affordable. We printed our logo and phone number on this bag, we have received several calls of interest that came from consumers seeing the bag out and about around town. This was a great idea, I will definitely be ordering another bag from them for our next event. I put a company handout inside each bag, fold it up and hand it out this way. No one ever expects anything to be in the bag when they unfold it, it is a nice surprise that everyone always reads. good size, the folding button works well and it doesn't bust open like the last company we used. I strongly recommend using custom earth promos they have never failed me in 2 years of ordering eco friendly products. They have a great helpful staff and they work with you on price based on your quantity. 5 star rating from me. Keep your business one step ahead of the competition and stand out from the crowd with eco-friendly Wholesale Folding Tote Bags. 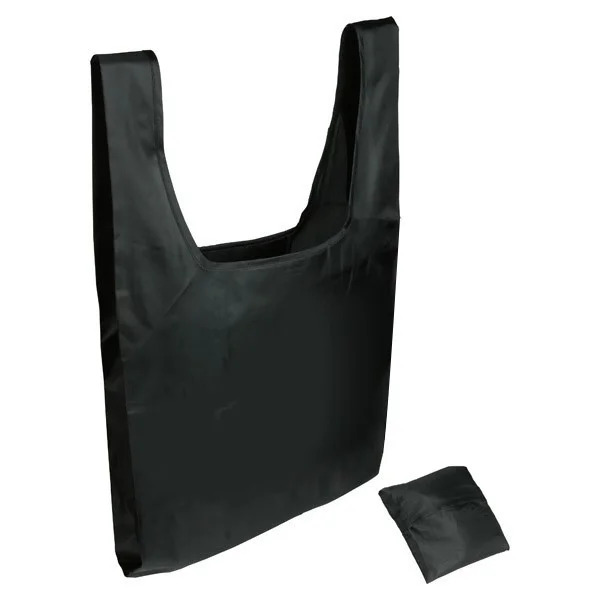 Work directly with a Custom Earth Promos design expert to customize your order of reusable and recyclable totes. Eye-catching custom graphic imprints of your company name, logo or tagline are strategically placed for maximum exposure on the wide imprint area of 12" W x 8" H. Convenient and easily stored into its' compact inner pouch, reusable folding totes make a great alternative to wasteful plastic bags. With Custom Earth Promos casual and eco-conscious tote bags to increase exposure for your business, charity or cause, you'll be making a cost-effective investment in both brand marketing and environment preservation. With a casual style that features sporty shirt strap-style handles and lightweight material, these folding totes are ready to go anywhere your customers go. Custom Earth Promos reusable and recyclable bags are designed for extended use with 190T polyester and combine high quality with trendy fashion to best represent your business. Your brand will not only gain visibility but also recognition as an entity actively invested in environmental preservation. This will help to foster positive associations for your business, creating personal connections with potential customers who admire a brand committed to the environment. Custom Earth Promos folding totes provide a trendy and fashionable method of marketing and an eco-conscious alternative to plastic shopping bags. With bold color choices that include black, red, blue, and green, bags orders can be fulfilled in the color of your choice or customized to include two or more of your favorite shades. 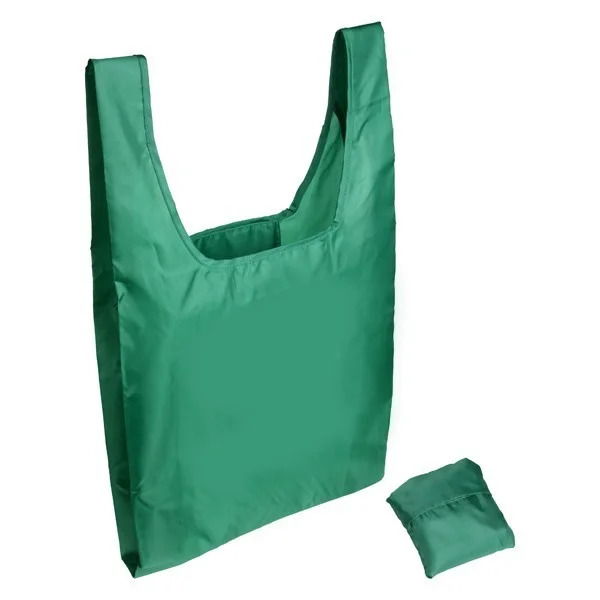 The large 16" W x 16" H size folds compactly into the attached 5" W x 5" H inner pouch, making it easy for your customers to use, store and reuse over and over again. Recyclable and reusable folding totes combine the best aspects of product durability, convenience, and style. 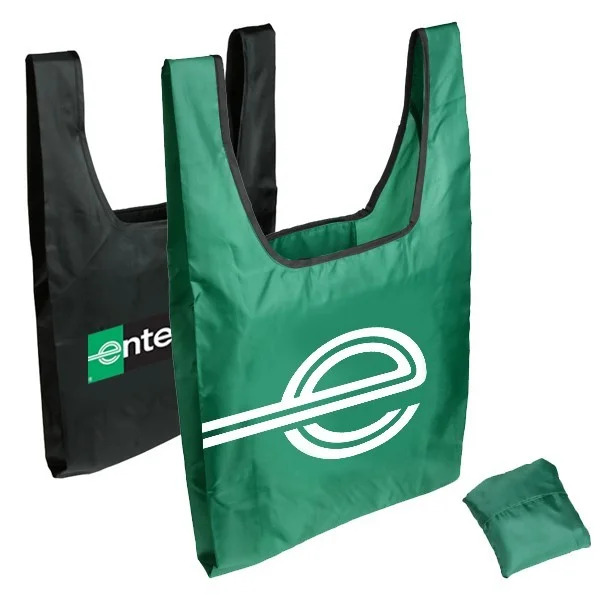 Customers will be using your folding totes for trips to the gym, picnics, play dates, travel, shopping, game nights, pool and beach excursions, increasing brand exposure everywhere these bags happen to go. By proudly promoting your message through a stylish and environmentally responsible product, you'll be gaining optimal exposure and strengthening an eco-responsible brand image. Meet and exceed your promotional needs with multiple customization options that are available when choosing to order direct overseas with Custom Earth Promos. Work with our expert design team to define your goals and build a product from scratch that best expresses your brand values. Achieve a premium finish on your graphic imprint and explore edge-to-edge printing options using the latest technology. Custom define fabric colors to best complement your brand logo for a personalized look. Increase material density, adjust the product dimensions, include zippers, extra pockets or add insulation to your custom folding tote bag order. Whatever your dream design, Custom Earth Promos will bring it to life!